› Author Affiliations Funding The Hokusai-VTE study was sponsored and funded by Daiichi Sankyo Pharma Development, Basking Ridge, New Jersey, United States. The authors are solely responsible for the content of this article. This study has been independently initiated by academic investigators; Daiichi Sankyo provided support for performing statistical analysis. The work of Stefano Barco is supported by the German Federal Ministry of Education and Research (BMBF 01EO1003 and 01EO1503). Background Time in therapeutic range (TTR) measures the quality of vitamin K antagonist (VKA) anticoagulation. In patients with atrial fibrillation, the dichotomized SAMe-TT2-R2 score (≥2 vs. < 2 points) can predict if adequate TTR is unlikely to be achieved. 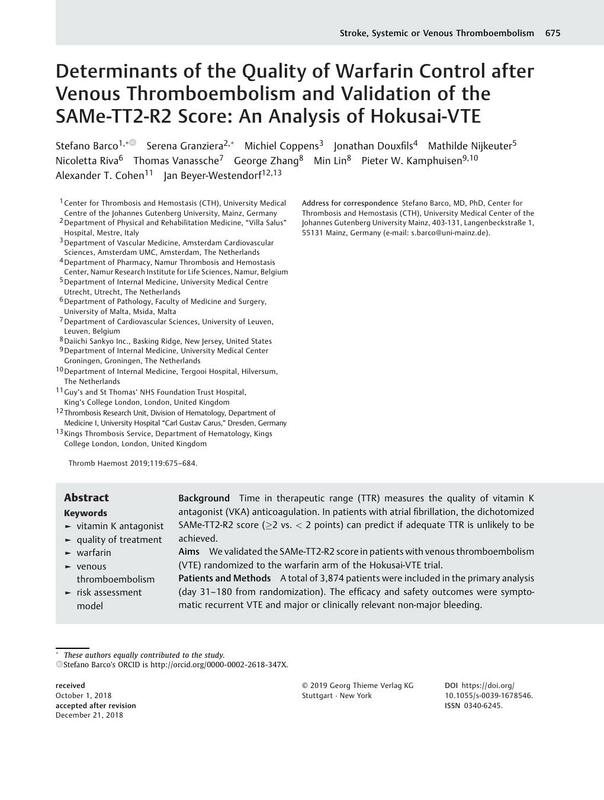 Aims We validated the SAMe-TT2-R2 score in patients with venous thromboembolism (VTE) randomized to the warfarin arm of the Hokusai-VTE trial. Patients and Methods A total of 3,874 patients were included in the primary analysis (day 31–180 from randomization). The efficacy and safety outcomes were symptomatic recurrent VTE and major or clinically relevant non-major bleeding. Results The rates of recurrent VTE and bleeding events were higher in patients with a TTR below the median (< 66% vs. ≥66%) resulting in an absolute risk difference (ARD) of +0.5% (95% confidence interval: 0%, +1.1%) and +2.2% (0.9%, +3.5%), respectively. Patients with high SAMe-TT2-R2 score were 76% of total and had lower median TTR (64.7% vs. 70.7%). The SAMe-TT2-R2 score exhibited low negative (0.59) and positive (0.52) predictive value (TTR threshold 66%), and poor discrimination (c-statistic, 0.58). ARD between patients with high and low score was 0% (–0.6%, +0.7%) for recurrence and +1.3% (–0.1%, +2.7%) for bleeding. Results were confirmed in sensitivity analyses focusing on the whole study period (day 1–365). Conclusion In VTE patients, the SAMe-TT2-R2 score showed unsatisfactory discrimination and predictive value for individual TTR and did not correlate well with clinical outcomes. The choice of starting a patient on VKA cannot be based on this parameter and its routine use after VTE may not translate into clinical usefulness. Stefano Barco and Serena Granziera: concept and design of the study, interpretation of the results, writing of the manuscript and final approval. George Zhang and Min Lin: statistical analysis, interpretation of the results, critical revision of the manuscript and final approval. Michiel Coppens, Jonathan Douxfils, Mathilde Nijkeuter, Nicoletta Riva, Thomas Vanassche, Pieter W. Kamphuisen, Alexander T. Cohen and Jan Beyer-Westendorf: interpretation of the results, critical revision of the manuscript and final approval.